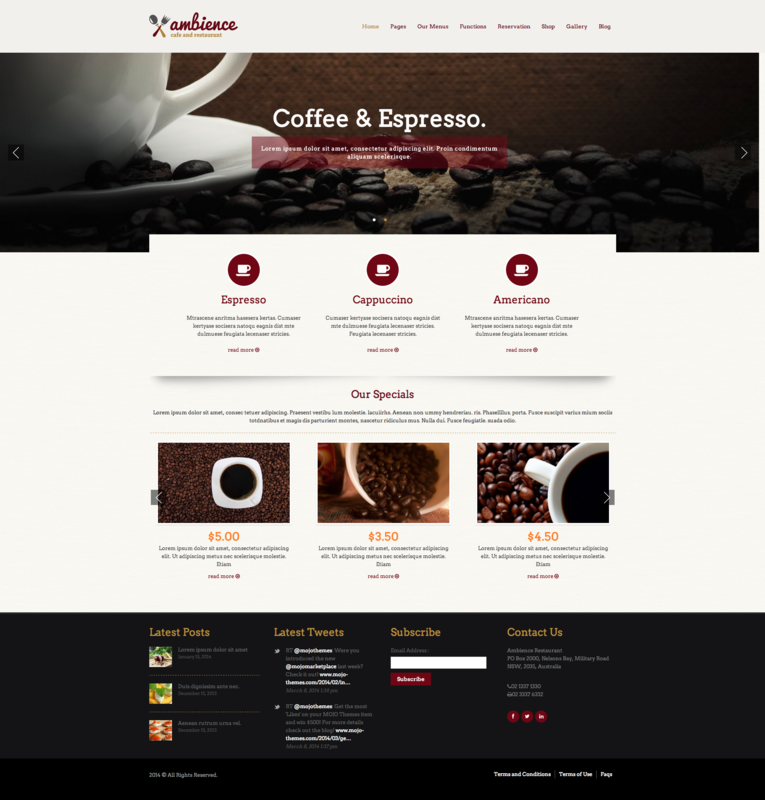 Ambience is a fully responsive modern theme perfect for any restaurant, cafe and bar. 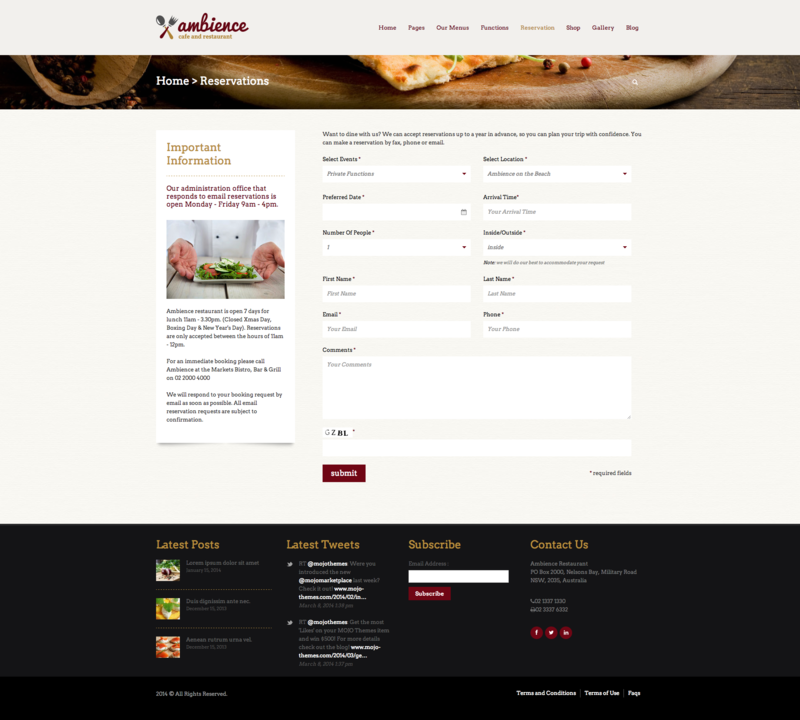 You can set reservations for your customers to come in at a time that suits them the best, you can fully customize the website to suit your needs, and without the need to code any CSS or HTML, you’ll ready serve your customers! With this theme you get an extra $40 free worth of plugins! You get Revolution Slier which is a fully responsive slider, as well as Visual Composer, the best thing since TinyMCE! Template is full compatible with WPML multilingual plugin. You can translate your website to any langauge you want.Please click the following link to get teh WPML plugin. Tempate comes with RTL support that you can use to create website in Arabic, Urdu, Persian, Hebrew etc. Typography for body text and all headings. Drag and Drop page builder interface. This template includes a license of popular Revolution Slider Plugin( 15$ value included with this theme). With the use of this plugin you can create different types of slider with tons of transition effect and you can also embed videos easily. 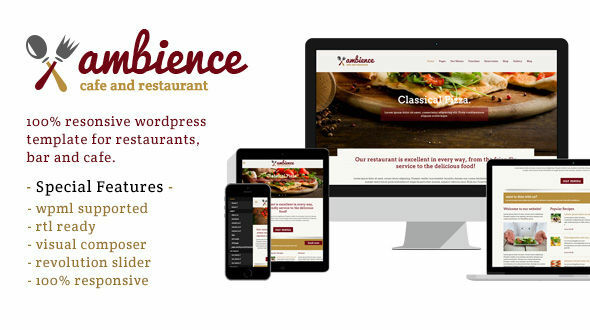 The Ambience Restaurant WordPress theme looks great on all devices, from large screens to mobile and tablet devices. This theme comes with the innate ability to change almost all of the CSS without the need to know all the colours. Ambience comes with detailed instructions on how to manage the theme, so you’ll never be lost or confused on how to maintain your website.